Mahatma Gandhi’s ideals are betrayed every day by those who distort Hinduism to promote a narrow, exclusionary bigotry. Mahatma Gandhi’s 150th birth anniversary year (2 October is his 149th birthday) comes at a time when his legacy, the very idea of Gandhi, stands challenged by the prevailing ideological currents. At a time when the standing of his historic detractors, whose descendants now form the ruling dispensation in the country, is at an all-time high, Gandhiji has been criticised for weakness, for having bent over too far to accommodate Muslim interests, and for his pacifism, which is seen by the jingoistic Hindutva movement as unmanly. The Mahatma was killed, with the name of Rama on his lips, for being too pro-Muslim. Indeed, he had just come out of a fast he had conducted to coerce his own followers, the ministers of the new Indian government, to transfer a larger share than they had intended of the assets of undivided India to the new state of Pakistan. Gandhiji had also announced his intention to spurn the country he had failed to keep united and to spend the rest of his years in Pakistan, a prospect that had made the government of Pakistan collectively choke. But that was the enigma of Gandhiji in a nutshell: idealistic, quirky, quixotic, and determined, a man who answered to the beat of no other drummer, but got everyone else to march to his tune. Someone once called him a cross between a saint and a Tammany Hall politician; like the best crossbreeds, he managed to distil all the qualities of both and yet transcend their contradictions. The contradiction is mirrored in the attitude of the Hindutva-inspired BJP government of Prime Minister Narendra Modi. Modi was schooled, like other RSS pracharaks, in an intense dislike for Mahatma Gandhi, whose message of tolerance and pluralism was emphatically rejected as minority appeasement by the Sangh Parivar, and whose credo of non-violence, or ahimsa, was seen as an admission of weakness unworthy of manly Hindus. Hindutva ideologue V.D. Savarkar, whom Modi has described as one of his heroes, had expressed contempt for Gandhiji’s ‘perverse doctrine of non-violence and truth’ and claimed it ‘was bound to destroy the power of the country’. But Prime Minister Modi, for all his Hindutva mindset, his admiration of Savarkar and his lifetime affiliation to the Sangh Parivar, has embraced Gandhiji, hailing the Mahatma and even using his glasses as a symbol of the Swachh Bharat campaign, linking it to a call to revive Gandhiji’s idea of seva through the recent ‘Swachhata Hi Seva’ campaign. This may, or may not, represent a sincere conversion to Gandhism. 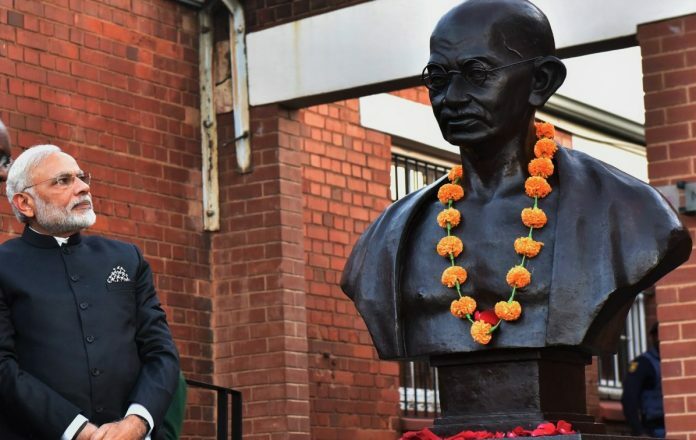 PM Modi is hardly unaware of the tremendous worldwide reputation that Mahatma Gandhi enjoys, and is too savvy a marketing genius not to recognise the soft-power opportunity evoking Gandhiji provides, not to mention the global public relations disaster that would ensue if he were to denounce an Indian so universally admired. There may, therefore, be an element of insincerity to his newfound love for the Mahatma, as well as a shrewd domestic political calculation. But the ambivalence speaks volumes: when many leaders of Hindutva groups, including BJP MP Sakshi Maharaj, call for replacing Gandhiji’s statues across the country with those of his assassin, Nathuram Godse, the PM seeks to lay claim to the mantle of his fellow Gujarati for his own political benefit. At the same time, there is also a tangible dissonance between the official governmental embrace of Gandhiji and the unofficial ideological distaste for this icon, which is privately promoted by members and supporters of the present ruling dispensation, some of whom have not hidden their view that his assassin was, in their eyes, a patriot. It is a well understood reality that the vision of Gandhiji, an openly practising Hindu, differed greatly from that of Veer Savarkar and M.S. Golwalkar, the principal ideologues of the Hindu Mahasabha and what was seen as its more militarised alter ego in the post-Independence era, the Rashtriya Swayamsevak Sangh, and eventually, the Bharatiya Janata Party (formerly the Jan Sangh). Gandhiji embodied the central approach of Advaita Vedanta, which preached an inclusive universal religion. Gandhiji saw Hinduism as a faith that respected and embraced all other faiths. He was profoundly influenced by the principles of ahimsa and satya and gave both a profound meaning when he applied them to the nationalist cause. He was a synthesiser of cultural belief systems: his signature bhajan of Raghupati Raghava Raja Ram had the second line Ishwar Allah Tero Naam. This practice emerged from his Vedantic belief in the oneness of all human beings, who share the same atman and therefore should be treated equally. Such behaviour did not endear him to every Hindu. In his treatise on ‘Gandhi’s Hinduism and Savarkar’s Hindutva’, social scientist Rudolf Heredia places his two protagonists within an ongoing debate between heterogeneity versus homogeneity in the Hindu faith, pointing out that while Gandhi’s response is inclusive and ethical, Savarkar politicises Hinduism as a majoritarian creed. But Gandhiji’s own understanding of religion, in Heredia’s words, “transcended religiosity, Hindu as well as that of any other tradition. It is essentially a spiritual quest for moksha but one rooted in the reality of service to the last and least in the world”. Unlike Savarkar, who believed in conformity, Gandhiji was a synthesiser like no other who took care to include Indians of other faiths in his capacious and agglomerative understanding of religion. He took inspiration from not just Advaita Vedanta but also the Jain concept of ‘Anekantavada’ – the notion that truth and reality are perceived differently by different people from their own different points of view, and therefore, no single perception can constitute the complete truth. This led him to once declare that ‘I am a Hindu, a Muslim, a Christian, a Parsi, a Jew’. Hinduism and Hindutva, as I have argued in my recent book Why I Am a Hindu, represent two very distinct and contrasting ideas, with vitally different implications for nationalism and the role of the Hindu faith. The principles Gandhiji stood for and the way in which he asserted them are easier to admire than to follow. But they represented an ideal that is betrayed every day by those who distort Hinduism to promote a narrow, exclusionary bigotry. The author is a Member of Parliament for Thiruvananthapuram and former MoS for External Affairs and HRD. He served the UN as an administrator and peacekeeper for three decades. He studied history at St. Stephen’s College, Delhi University, and International Relations at Tufts University. Tharoor has authored 17 books, both fiction and non-fiction; his most recent book is ‘Why I am a Hindu’. Follow him on Twitter @ShashiTharoor. This is in response to all the hateful, stupid and ignorant comments posted by other people. Chintan Popat, in Gandhi’s philosophy non-violence is not absolute, it is desirable but there are exceptions where violence is needed. It is ridiculous to say that he advocated anti-Harijan sentiments. All evidence is of the opposite. Gandhiji was racist in his opinions towards the Africans in the early years of his career in South Africa, when he was merely trying to find success as a lawyer. It was later that he transformed. Ramya, “going on to try and set narrative’s that Gandhi’s Hinduism is different as that of Modi’s Hindutva” doesn’t serve what purpose? The purpose of this article is to talk about Narendra Modi and Hindutva’s engagement and relation with Gandhi, not to give an account of Congress’ work. Aruna Krishnan, what is wrong in intense dislike of a person when it is because of some valid reasons? Shubham Patel, would you care to say why you think it is an illogical opinion? Avadhoot Dandekar, monism of Advaita Vedanta does not mean that a country cannot be divided into provinces. What is the ‘bashing Hindus’ that you are talking about? And Shashi Tharoor certainly does not have narrow thinking if compared to people like Narendra Modi and RSS. Vishal, yours is an illogical comment which did not even engage with the content of the article. Gruham Bendakaluri, why Shashi Tharoor hates Narendra Modi, he has explained in this article and various others, and critically thinking people who are not brainwashed can observe the deeds of Modi. Try asking the muslims in India to sing ‘Vaishnava Janato’ once year on his birthday, and you will realize who hates whom. BTW, why does the author of this article hate Modiji so much? As a part of Satya followd by Gandhiji,this Shashi Tharoor should come out with his Satya (truth about the unnatural death of his wife Sunanda Pushkar).That will be his tribute to Gandhiji. He was a charlatan for advocating very anti-harijan sentiments in his books but in Gujarati. Wasn’t his statue removed from African University for is racist ideology for the African community ? I am not a member of RSS , ABVP or any RW group but truth shall prevail. While dying, Mahatma Gandhi was reciting Ram Ram Ram. He was a devoted Hindu. He was a courageous person and a lover of truth. He has no hatred for any body else, even for British people who governed India. What has been mentioned in this article is a truth. The people who labelled charges against Gandhi ji that his personal character was not good, as he took help of ACHUT KANYAS in his personal life, how they can admire Gandhi ji ? For some people Ram is MARYADA PURUSHOTTAM and pronouncing RAM they will get MOKSH. For some people RAM is only a word to gain votes and political mileage. The people of India has to decide,they want a MARYADA PURUSHOTTAM RAM or a political RAM? The slogan of ONE NATION , ONE CULTURE and ONE LANGUAGE will ultimately divide this united INDIA into the small nations in EUROPE. Getting more and more disappointed with the author’s writings of late. Despite his wide experience, command over the language and good articulation, his intense dislike of PM Modi seems to have calcified his thought process. I have not come across a more obtuse article which has a beginning and end but no substance in between. Bringing in his newly authored book seemed very contrived, much like asked to write an essay on agriculture but end up writing about the Cow. As another reader said, could we have the intelligent and articulate Mr. Tharoor from his UN days back. Politics doesn’t seem to suit him and vice versa. The Most Hatred & Illogical opinion by Mr. Tharoor…!!!! I’d been a great admirer of you after watching your videos on youtube and had a firm belief that you should be PM candidate of INC.. but you’re giving only political speeches & editorials on every media platform for 2-3 years. We want Mr. Tharoor- The Original One Back..
On the Gandhi Jayanthi day, Modi should publish the details of the Rafale deal as a tribute to the father of the nation who believed in absolute transparency in financial matters. The author is a member of the Congress party, which has a @COPYRIGHT over Gandhi. Author’s party reserves full license to use all things Gandhi, including his surname. Any use or misuse of Gandhi surname or image, or any celebration of (original) Gandhi’s birthday is to be severely punished by a barrage of articles in leading English magazines in India. Leading leftist writers, however, have full freedom to write 1000 page books on Gandhi as long as they maintain leftist credentials, stay obedient to the first family and abuse Modi in at least 1000 words. Jai Ho! If Narendra Modi has been trained to dislike Mahatma Gandhi, then Congress has been trained to dislike Hindus and Hindutva. LOL ???? Vedanta is more than 5000 years old. The highest in Vedanta is Purusha which present in everyone and everything. It’s that non-dual (Ekam Advitium). This is that common thread passing through all of us and everything. If this is true, then how that mighty nation called Bharata has been divided into all these small pieces for all these years? It is probably because of the narrow thinking like that of yours. You are talking about political pluralism without knowing spiritual singularity for your political gains. You’re talking about Vedanta now after bashing Hindus for 70 years. It’s surprising that Congis are slowly discovering the importance of Vedanta, Hindus, Shivalinga, etc., after a gap of 70 years. I don’t think you will get political dividends for this cunningness ??????? ?